I decided to go with a sunburst mirror above my buffet, and after spending a couple of days looking at just about every sunburst mirror I could find online, and not finding one that would work (a design I liked + the right size + the right price), I decided to go way back into my blog archives to a project that I did in March 2011, a bring it back…with a twist. 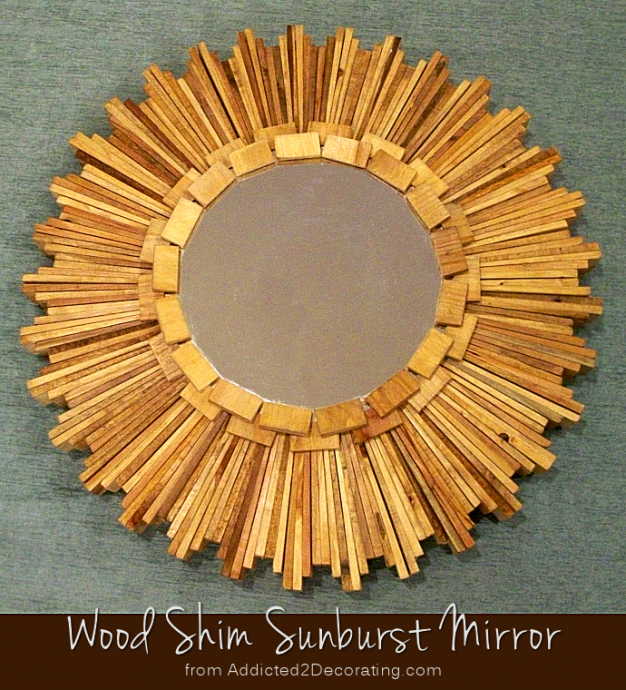 The project I’m talking about is my wood shim sunburst mirror. Remember that one? I’ve seen it all over Pinterest and on other blogs, but I’m pretty sure that’s an A2D original. 🙂 That one was made with the small wood shims (about 6 inches long) from Home Depot, and if I remember correctly, it ended up being about 18 to 20 inches in diameter. I ended up staining it darker and using that sunburst mirror in the bedroom at the condo. I really love how it turned out. I wish I could get an accurate picture of the color, because it’s really beautiful. And it has this amazing variation of color throughout, so it’s not all one solid color gold. You can see it better in this close up picture. But it person, it’s much more noticeable, and that beautiful variation of color that gives it an antiqued look is my favorite part about this mirror. For this mirror, I used 6 packages of the large shims, and 9 packages of the small ones. 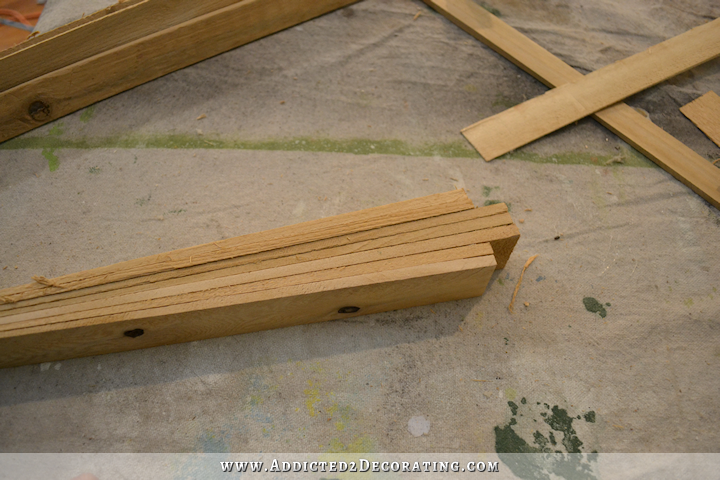 I also used almost an entire package of the large glue sticks (from Home Depot), which I already had on hand. I already had the mirror on hand as well, but I think I bought it either at Hobby Lobby or Michael’s many years ago. (See my edit below about the mirror.) It’s one of the thick, sturdy ones with the beveled edge. And then I used almost one package of gold leaf, which I bought at Michael’s (always with a 40% off coupon!). But when I flipped them over, the other side looked much nicer. 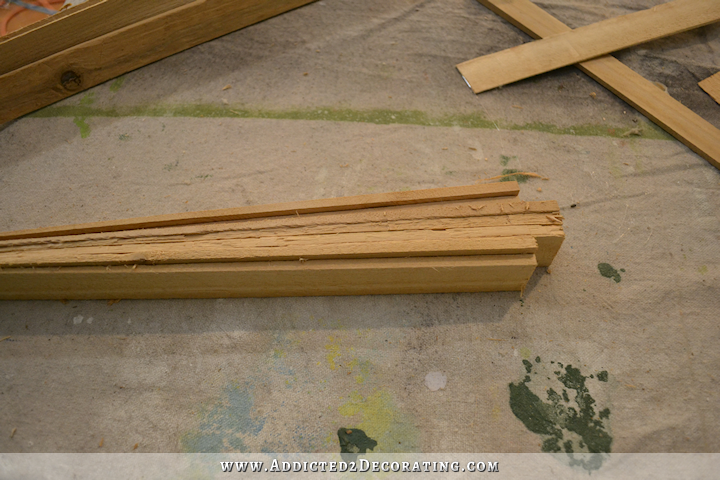 And for the short sections, I glued 9 of the short shims together, also in groups of three. 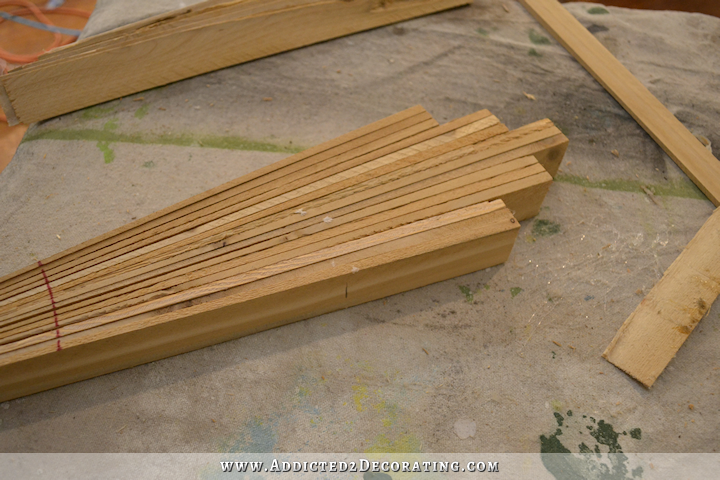 And once I had 12 long sections and 12 short sections, I glued them together in a circle. I didn’t actually attach the mirror yet. I just placed it on there to see how it would look. And here’s a hint…it didn’t go together perfectly and effortlessly in a perfect circle. There were some small gaps, so one of the short sections actually has four shims on one side (10 shims total). 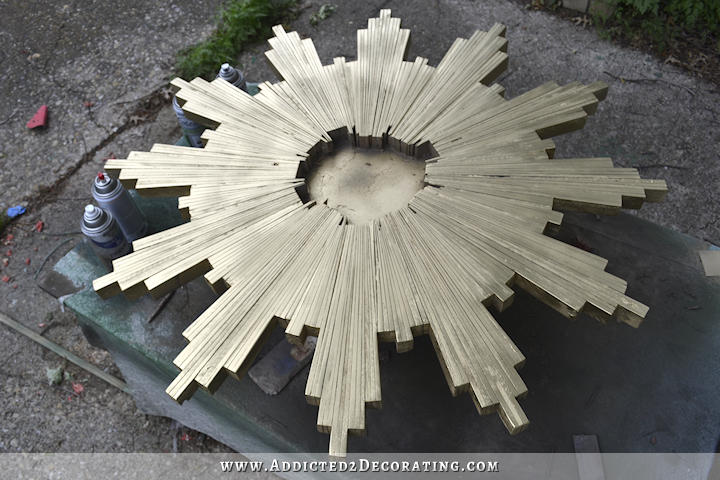 Another short section has two additional shims added going the opposite direction (with the fat end towards the center of the circle, and the thin end towards the outside of the sunburst) in order to fill in some gaps so that the circle would close. But no one would ever notice those things unless I pointed them out. And even with those additions to fill in gaps, I still had to really put some muscle into making it all come together into a perfect circle, and I had to add more glue here and there as the stress of pulling one section would pull apart another section. But once I got everything glued and held in it place for about 15 seconds until it dried thoroughly, it looked pretty close to perfect. Then I sanded. And sanded. And sanded some more. I used my electric sander with 150-grit sanding discs on the top, and then sanded all of the edges and ends of the shims by hand with 150-grit sandpaper. Then I primed and painted it with Rust-Oleum spray primer and gold metallic spray paint. I let the paint dry for about an hour, and then I gold leafed the entire top. I didn’t gold leaf the edges or ends, though. Just the top. And finally, I sanded the top VERY lightly with 150-grit sandpaper, following the lines of the shims, just to add an aged, antiqued look and to dull down some of the shine on some of the shims. Again, this was very light, very quick sanding, and I did NOT make an effort to hit all of the shims, because I wanted some of them to stay shiny, and wanted to dull down only some of them. And then, of course, I glued the mirror to the front. I hung the mirror on the wall using a 5-inch Ook Hangman French cleat from Home Depot. I tried to get it centered vertically, but I think I miscalculated and hung it a bit too high. I’ll have to move it down just a touch. EDIT: That particular mirror is really a placeholder. I want to eventually remove the beveled-edge mirror and replace it with a round mirror that has a simple but pretty frame on it. 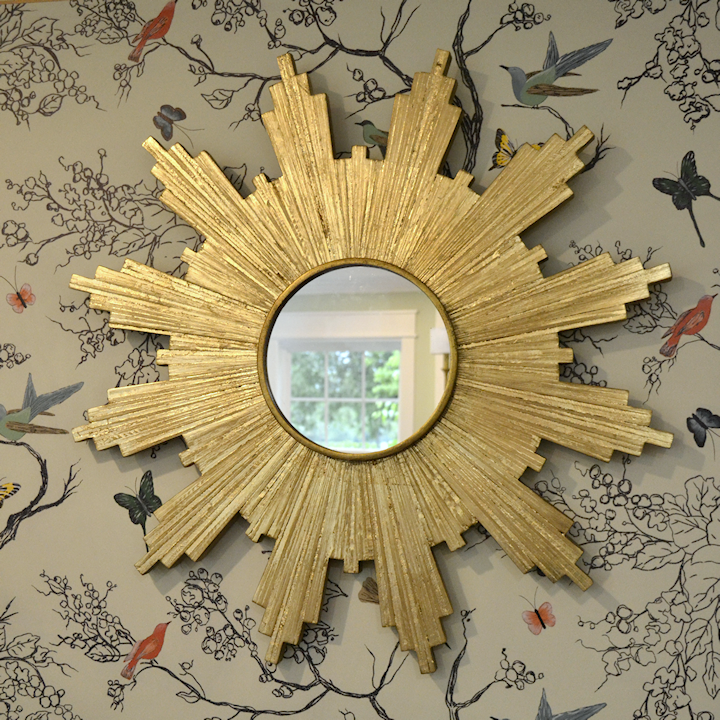 I just wanted to get the sunburst portion made and hung to be sure that I was even going to like it for that wall before spending more money for a framed round mirror. So I just used what I had on hand for the mirror. Now that I see that I really do like it, I’ll be keeping an eye out for a framed round mirror to go in the center. So that’s all I’m going to hang on that wall. I wanted my mural to be a backdrop, and not artwork in itself. But I also don’t want to cover up too much of it. I think one mirror is enough. And I’m still contemplating these lamps, with different shades, of course. I know the silver is distracting, but I’ve taken apart, repaired, put together, and made so many lamps in my life that I don’t think it would be difficult at all to take it apart, paint all of the metal, and put it back together. And now that I have my acrylic curtain rods (which were delivered on Friday…yay!! ), I love how they complement each other. 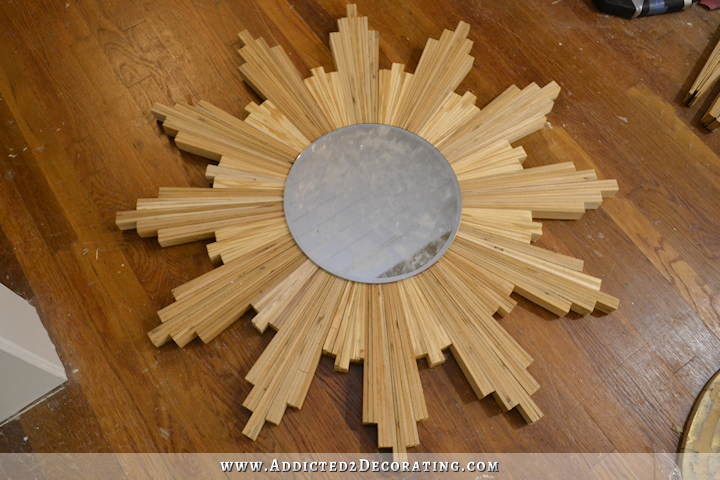 UPDATE: I found the perfect mirror for the center of my sunburst at Hobby Lobby. It was the right size, had an understated frame around it, and it was already the perfect color. And best of all, it was on sale for 50% off, so I paid about $9 for it. That design would make a great wall clock! The mirror looks beautiful! I wish I had the patience to projects like this. For the lamps — I bought similar lamps from Home Depot and went with black shades. I was very nervous because black shades are so far out of my comfort zone, but they are so pretty with and without the lights on. I love the variation that gold leaf adds, compared to gold paint. However, I personally have been a little slow to try it, not just because of the mess it can make, but also because I’ve heard that it can oxidize. Have you had that happen to you, Kristi? Yes, but they have a clear spray that made for use over metal leaf to keep it from oxidizing. I didn’t buy any to use on this, because quite honestly, I wasn’t sure if I was even going to like this mirror, so I didn’t want to spend the extra money. But now that it’s up, and I really do like it, I’ll probably pick some up and spray it so that that doesn’t happen. Love how the mirror turned out! Did you consider maybe running a gold braid around the edge of the mirror to finish it off? Hate to be a Debbie downer, but it kinda looks like what you did—stuck a mirror disk on top of the shims. IMHO, the braid would finish off the raw edge of the mirror. But maybe it’s just me, so please don’t take my comment the wrong way. I don’t mean to insult you at all! You’re not a Debbie Downer, and I totally forgot to mention that that mirror is kind of a placeholder until I find one I like. I wanted to get the sunburst portion finished, and get it hung on the wall, to see if I even liked it for that wall and for the room. I just used a mirror I had on hand. Now that I see that I really do like the sunburst mirror on that wall, I’m going to keep an eye out for a framed round mirror that I can use in the center. 🙂 So eventually that particular mirror will go back into my stash, and it’ll be replaced with something that already has a finished (framed) edge. Oh, that’s a good idea! I love the design, wish I had that kind of perseverance! Sunshine for the birds and butterflies! I love it! Beautiful and a fun project. I would love to see a full wall picture now that it is coming more and more together. Love the mirror and I am glad you took the time to create one. It looks great on your wallpaper wall! Woot! Woot! Once again I’m in awe of your talent and fortitude. JMO but I wouldn’t spend all that time redoing those lamps. Keep them as place holders until you find the perfect pair. Question for you. A couple if years ago, when you were working on the kitchen, you wrote a blog about mixing metals, and how you liked doing that. So far, I see only gold in this room? Have your feelings changed on this subject? I still like the idea of mixing metals, in theory. 🙂 I have mixed metals in my kitchen, but for some reason, it doesn’t appeal to me in my dining room and entryway. I might find a way to bring on some other metals as I get more into the decorating of the room, but it’ll probably be in very small amounts. Bravo Kristi! The entire wall is beyond beautiful! 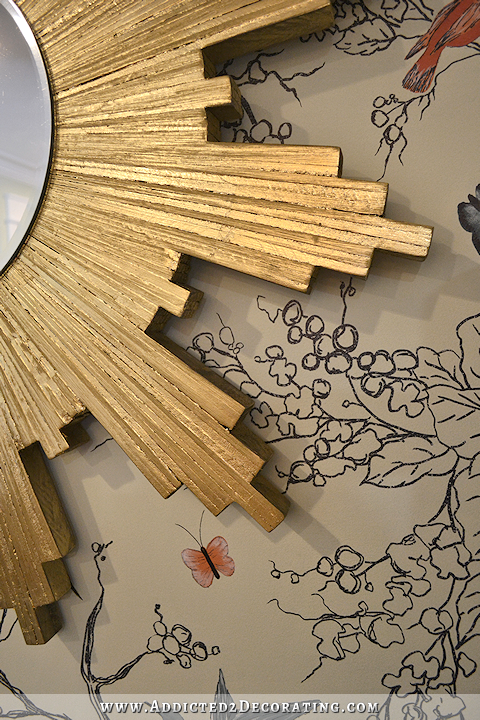 The sunburst mirror makes sense on this “nature” themed wall. Love watching your creative process. The mirror is lovely! Cool! I wonder if gold lampshades might be too much … maybe black to match the furniture can tie it all in nicely. I have a black silk lampshade with a gold lining (lampshade material not gold fabric). It is beautiful whether lit or not. That came out really cool! How do you clamp the pieces in the circle shape while it’s drying? I think the lamps would look better gold instead of silver to complement the gold in the mirror and border on your mural. It’s fun watching this beautiful room come together. I held it together with my knees and my hands. 🙂 Since I was using hot glue, it only took about 15 seconds for it to dry enough to hold it securely. So pleased you got to do a creative piece. 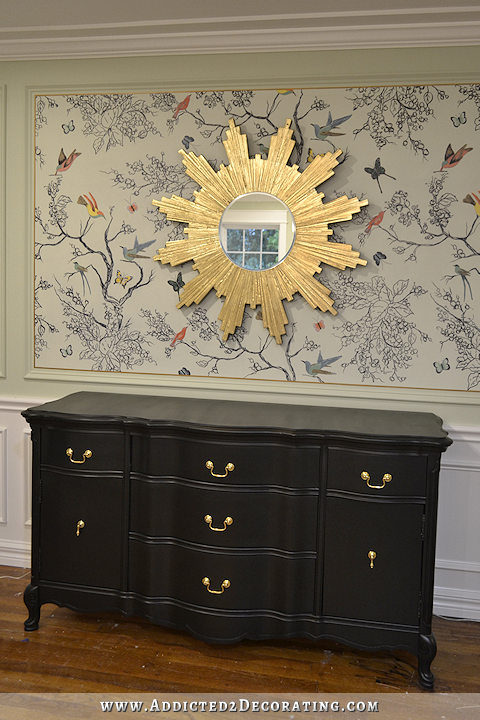 The Sunburst mirror looks fantastic on your entryway wall with your custom wallpaper and the antique gold being mimicked in the buffet hardware. You’ve done it again Kristi, wow’ed us with your vision, design and DIY skills. It’s getting very exciting seeing this all come together! Well done. Perfect! 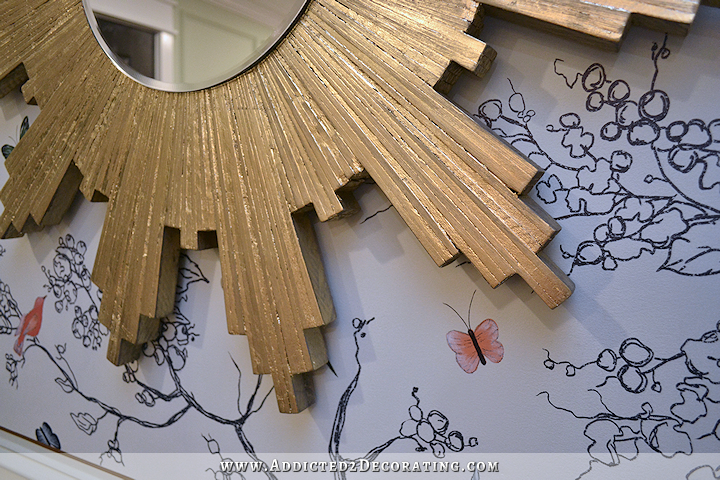 It is so much better for this wall than the scallopped mirror you showed us as an inspiration in a previous post. Kristi, the mirror is perfect there, I just love it. I also love how it picks up the gold from your buffet handles. I am anxious to see what you decide to do with the lamps. Someone suggested black shades, i would love to see how they would look. So gorgeous, especially with the backdrop! I’m NOT showing my daughter. She’s going to want to have me help her make one. I think the mirror is PERFECT and I just love it against the “wallpaper”. I also like the acrylic lamps with just the right shade (not sure what that would be). I like the mirror hung where it is. By the time you get accessories on the buffet, hanging it lower might look unbalanced, ya think? Once again, your resourcefulness and creativity have produced a lovely accent piece for your home! You know, it’s scary that I really can relate to that! Love, love, love your mirror! Looks absolutely perfect on your beautiful wall art. I agree with Alta Craig that you should leave the mirror as is. When you frame something with a mat the lower portion of the mat is always larger that the sides and top – the eye sees it as the same. The same visual goes for your mirror placement. Anyway what ever makes you happy, you do a fabulous job at what ever you touch. All I want to say is “WOW”! So beautiful! I am not very good at using hot glue. How did you stop the glue from oozing out on to the front of the shims? I always have a blob that I can never get totally off!!! I just used a thin, straight bead of glue right down the center of each shim lengthwise. There wasn’t nearly enough glue used that it would squeeze out. I’m not a sunburst mirror kind of person but I think using one shiny large thing in the center of all that is a perfect idea. And, personally I preferred a non-matchy look so I would change shades but I like your lamps and the silver guts that show. Love, love, love it. Would black shades work on your lamps, or would that just be too much black there? I know it’ll all work out perfectly when you are finished with it! I really like the mirror! 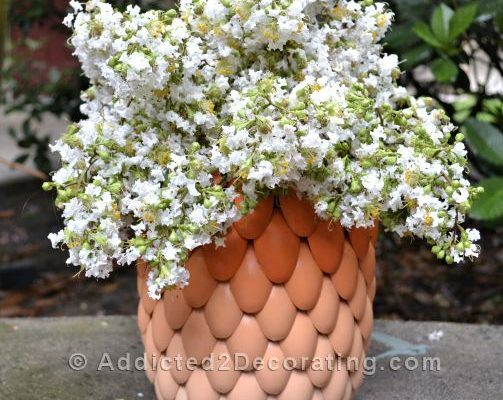 So did you use hot glue and a glue gun? In the pictures, at least, it does not look like just a “placeholder.” It looks like part of a planned interior decor design. Well done! And I can still see most of the birds! Love the mirror. Nice job – and it looks great on the wall. I’m not so convinced about those lamps though. I’d prefer to see sconces on the wall – in the outer sections of the mural – but barring that option I think lamps with a simpler base would be better. Those look clunky and stumpy to me on the top of the buffet. I think something tall, dark metal and narrow would be a good choice with a smaller diameter shade. It is all “singing” together! Gorgeous. You are so creative and FAST! I heard angels sing when I opened your page! Absolutely beautiful! After painting the lamp guts, I agree with them on the black shades…but maybe have them slimmer & a little taller? BRAVO! Clever. Sunburst mirrors must have been popular in the 1940s also. My parents got one as a wedding gift. Love it Kristi! 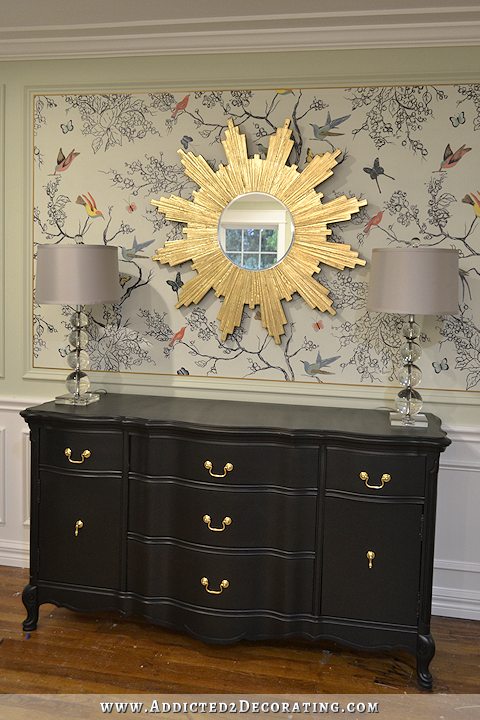 So many people seem to be suggesting black lampshades and gold guts on your lamps! Maybe I’ve just been on a tassle-loving kick here lately but the idea of a black shade with a colorful tassle or two in there got me really excited! Whatever you choose will be perfect…it’s all coming together now! I absolutely love the mirror, the mural, and buffet! I can’t get into the lamps there though. For some reason, they just don’t do it for me. They detract from the beauty of the rest of the grouping. JMHO….the one thing I do know, when you get totally finished, it will be spectacular!!! Love it! It really is the perfect piece to keep the wallpaper a background, but still let it shine!The gray shades I’m now not too sure about. What about changing shadecolor to the pale aqua (green?) 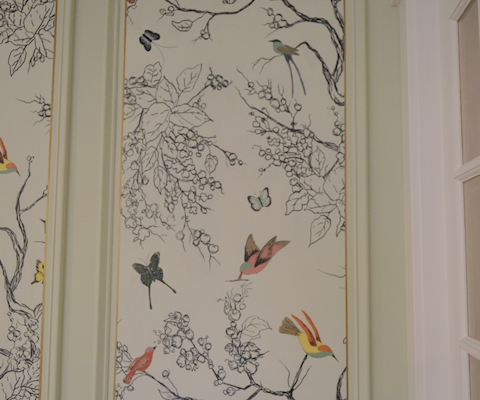 in the bird in the wallpaper (because I think coral would be overwhelming) – would look great if you can change center rod in lamp to gold. I quit – I know you’re already 100 steps ahead of my thinking lol! Hi. I do see the variations in color of your sunburst mirror and I love it. Also love the lamps and it will be gorgeous when the lamp metals and shades are fitted just right. Just so perfect Kristy. You are so talented! I like this one better!!! you are so talented..
Where did you get the shims? They are just the right size. PS Love your projects and progress! WAY COOL….loving this room…cant wait to see the drapes! Your mirror is great! I’ve seen many on line & they can be very expensive. The fact that you made yours must bring you a lot of satisfaction. I’m with you on making drapes. 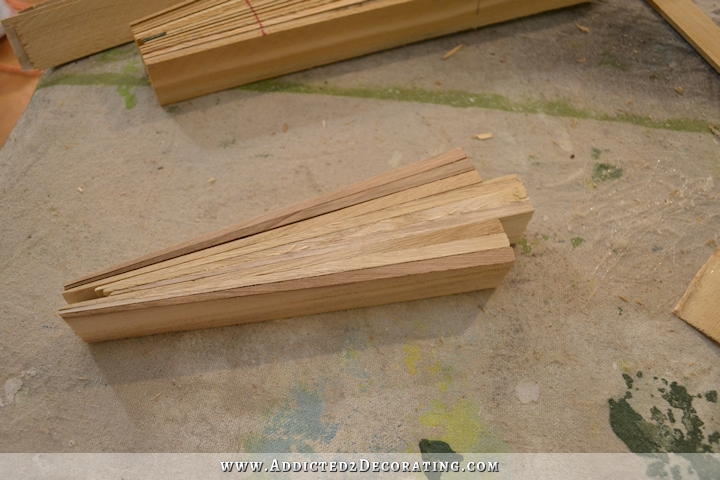 Your tutorial has helped me make some beautiful, custom, affordable window treatments. So thank you for that. But standing over my work table, hemming, sewing, kills my back. I can only do it for a few hours before I have to sit down. That’s from my bad posture. I have 8 panels I need to get done & I’m dreading it. You lay yours out on the floor, right? That can’t be comfortable either. PurrrrrrrrrFECT. Change anything in this foyer (aside from adjusting those fab lamps a lil) amd I will have to go to Waco and hurt you. I love both. They are equally beautiful. What a fantastic job you did! It’s absolutely, positively gorgeous. You are a force. Wow, this is just beautiful. I’m so impressed at your resourcefulness! Looks like such a rich gold piece, rather than a cheap one. I didn’t even notice that it was just a placeholder mirror, the piece looks finished to me. 😡 I know you’ll do nothing but improve on this room. I agree though, I think the silver looks great with the gold and black. Different lampshades will be pretty! Lamps are excellent; just change shades’ color to another metallic, maybe. Perhaps your coral color in metallic would be pretty. LOVE the mirror! You inspire me to go ahead with plans for my own! On the lamps …. I wouldn’t change them at all! 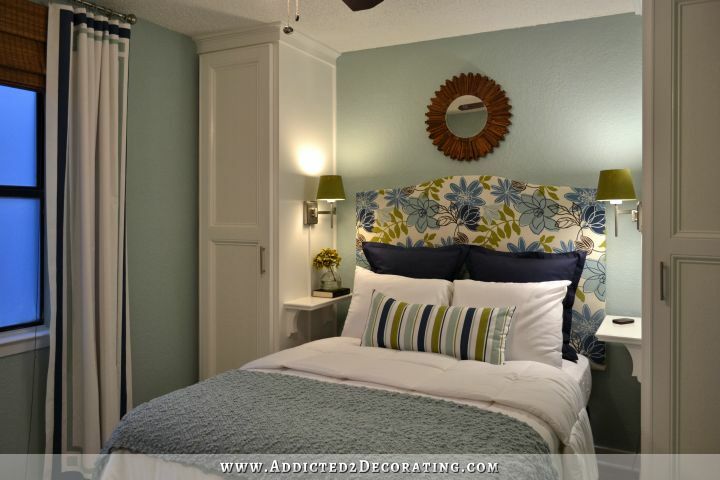 But I’m okay with mixing metal finishes ….. and here’s why for your room. To me adding more gold would be too much gold AND I think the silver is a nice compliment to the fine sketched black lines in your mural. NOR would I add black lampshades – I think that would be too much black and weigh down your space. 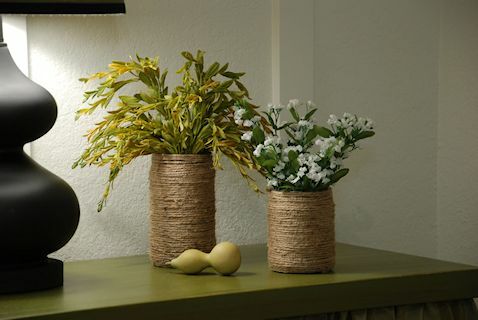 A couple of simple accent decorative pieces and you’re done! Perfection! I would decide on the lamps last/later. I would do the larger components ( furniture, seat cushions, etc.) first. Anyway, just a thought! 🙂 It’s all looking gorgeous! Absolutely gorgeous! And thanks for the inspiration for something to fill a hole I hadn’t decided on in my master bedroom! Love, Love, Love this mirror!!!!!! Great job! I’m going to run out and get shims and make one, too. Just beautiful Kristi. I’m in love with this mirror. I can’t wait to see what you decide to do. Sure wish I could decorate half as good as you.